I have to admit, I do not know much about the Divine Mercy Novena. That is next novena that we will be praying, 99,000 people strong, found on the website Pray More Novenas. If you would like to join us here is the link: http://www.praymorenovenas.com/divine-mercy-novena/. There is an interesting story behind why we are praying that novena. In 2011 and 2012, John Paul Deddens choose that exact novena for us to pray for the canonization of Pope John Paul II. He plans to start this novena on Good Friday and end on Divine Mercy Sunday which is when John Paul II and Pope John the XXIII will be canonized. In 1931 Jesus appeared to young religious named Sister Faustina (Helen Kowalska). Jesus appeared cloaked in a white garment with one hand raised in blessing and His other hand touching His heart. Radiating from Jesus' left breast came forth one red and one white ray. Jesus asked Sister Faustina to paint that image and the words: "Jesus I trust in You." He told her that the white ray stands for the Water that makes souls righteous and the red ray stands for the Blood which is the life of souls. Jesus also said these two rays come from the depths ofMy Most tender Mercy when My heart was opened by a lance on the Cross....fortunate is the one who will dwell in their shelter, for the just hand of God will not lay hold of him. Jesus asked Sister Faustina to pray for a different intention on each day of the novena. Jesus wanted to immerse those very souls in His Divine Mercy. DAY 9 (Easter Saturday)- The souls who have become lukewarm. Unlike the Divine Mercy Novena, I do pray the Divine Mercy Chaplet. This is prayed using a rosary. The two opening prayers, prayed on the first bead next to the crucifix, are: You expired, Jesus, but the source of life gushed forth for souls, and the ocean of mercy opened up for the whole world. O Fount of Life, unfathomable Divine Mercy, envelop the whole world and empty Yourself out upon us. 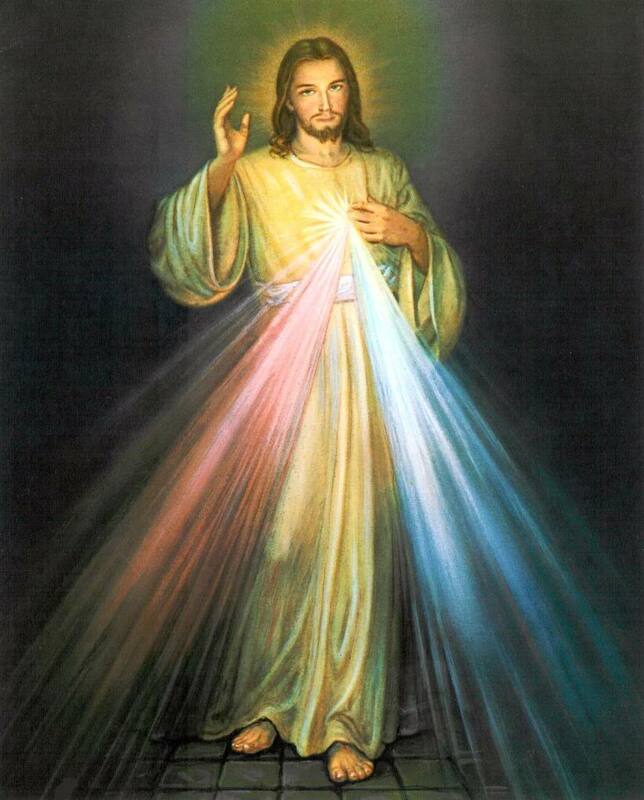 And this second prayer which is repeated three times: O Blood and Water, which gushed forth from the Heart of Jesus as a fountain of Mercy for us, I trust in You! Eternal God, in whom mercy is endless and the treasury of compassion — inexhaustible, look kindly upon us and increase Your mercy in us, that in difficult moments we might not despair nor become despondent, but with great confidence submit ourselves to Your holy will, which is Love and Mercy itself. Amen. I do believe, all this writing about the Divine Mercy prayers means it is time for me to get to practicing what I preach! May God bless you and keep you during these final days of Lent leading up to Holy Week and Jesus' most sorrowful passion.